It was dumpling day at la maison de Tess. I began making dough for gyoza on Friday night to cook for Saturday’s dinner. Mr. Tess returned from Saturday morning errands with a package of shu-mai from Trader Joe’s for lunch. I had to laugh, because I’m sure he didn’t notice what I was making, but we both love dumplings. Check out another post about gyoza here. This dish is adapted from Chinese kitchens: rounds of wheat dough stuffed with minced pork and cabbage then boiled or steamed. Once upon a time, servants of wealthy houses ate leftover food from the family table. Dumplings with cold noodle dough and congealed meat are not appealing, so clever servants devised a method of pan-frying the dumplings to get a pleasant crisp texture and additional flavor. This style of preparation became popular in Japan. Mix the salt and flour together in a medium bowl. Add the boiling water a little at a time, stirring with chopsticks, until you can shape the mixture into a ball. Cover with a damp cloth and let it rest for at least 1 hour. Knead the dough until it’s smooth, about 5 minutes. 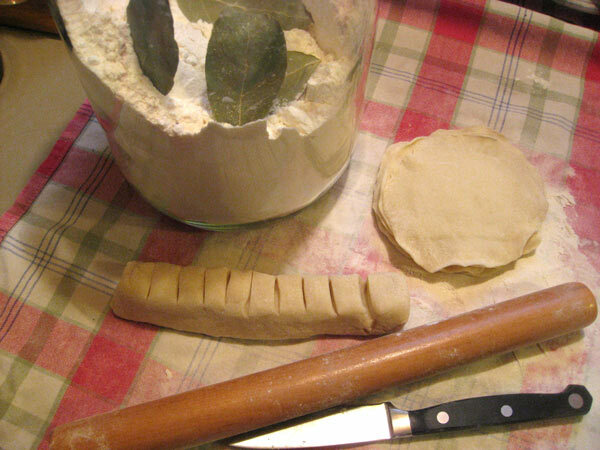 Divide the dough into quarters, then form each part into a log. You can proceed now to roll the wrappers, but I find it is easier to let the dough rest again because this dough is really elastic. That’s why I make the wrappers a day before. I cover the logs again with a damp cloth to relax again. When I get back to the kitchen, I score one log into equal segments. Ms. Shimbo says this recipe makes 40 wrappers, but they are rather thicker than I like, so I’d say each log should be marked for about 12 or 13 wrappers. I cut off a few segments at a time so the dough doesn’t dry out. Flatten a round in flour; roll it into a circle about 2 1/2″ in diameter. Then roll the outer edge thinner by rolling and turning the wrapper. The circle should be about 3″ across. 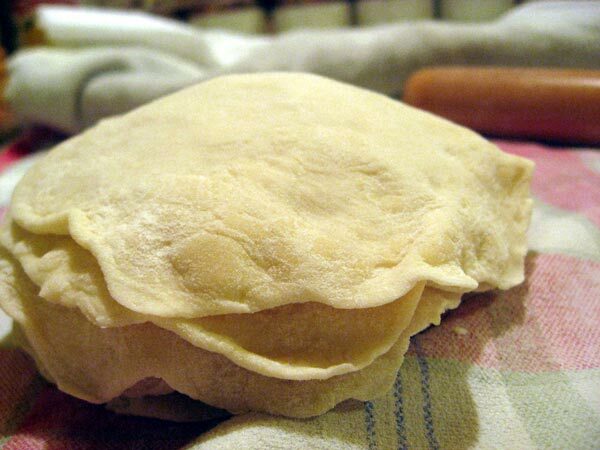 You want thinner edges because when you seal the dumplings, the edge is pleated and you don’t want it too thick. Dust each wrapper liberally with flour and stack them. I make 4 stacks. Wrap the stacks tightly in plastic wrap and refrigerate. Mince the cabbage and toss it with salt. Let it sit in a cloth (fukin) lined colander for 10 minutes. Squeeze to remove excess water. 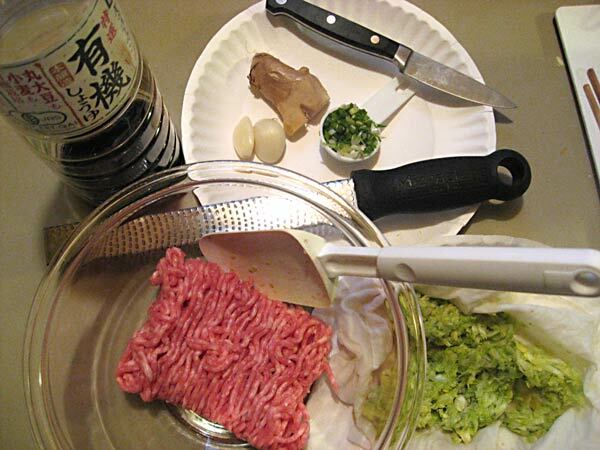 In a bowl, toss the ground pork with the shoyu, and mix until the pork is sticky. Mix in the cabbage, ginger, garlic, scallion, sugar and pepper. Divide the filling into quarters. You can gauge your filling per wrapper as you work. Put a small spoonful of filling in the middle of a wrapper, wet the edge with water, and fold the circle in half. Pinch at the top and make 3 pleats to the right, 3 pleats to the left. Squeeze the air out as you work. 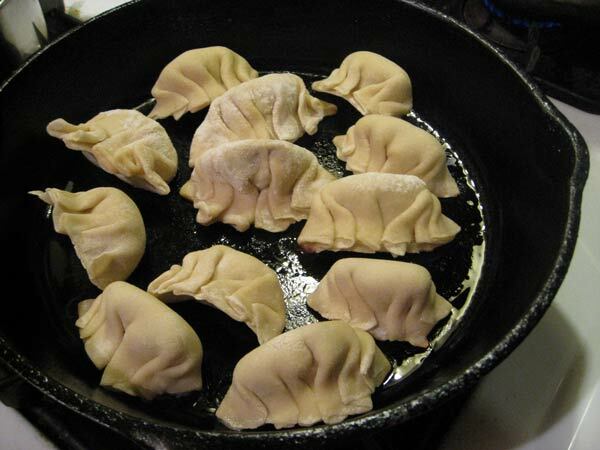 Place dumplings on a towel lined cookie sheet. Don’t let them touch each other. The dumplings won’t keep well in the refrigerator for very long (the dough gets gummy and sticky), but they can be frozen at this point. Over medium heat, heat a large skillet. Figure out how many dumplings will fit in your skillet without crowding and that will be the maximum you can cook per batch. Add oil to the hot skillet. When the oil is hot, place the dumplings in the pan, pleated side up and cook until their bottoms are golden and crisp. In a large liquid measuring cup combine boiling water and 1 1/2 to 2 Tablespoons oil. Pour that into the skillet so about 1/3 of the bottoms of the dumplings are covered with liquid. Cover immediately and steam over low heat for 8 minutes. Place the skillet on a wet towel to cool it quickly and use a spatula to carefully remover the dumplings to a serving platter. Cook the remaining dumplings the same way. Other gyoza recipes from Tess! WordPress.com bloggers: learn how to change the alignment of a poll! In Japan frozen gyoza, which was made of china, have big troubles. Chinese dumplings that caused food poisoning. Ｉ ｓｈｏｕｌｄ ｍａｋｅ ｄｕｍｐｌｉｎｇｓ　ｂｙ　ｍｙself. Next week I try it!! Yes, I have heard about the poisoned dumplings from China. That is scary. Making gyoza is fun. Many people have looked at this recipe, but they don’t leave comments. 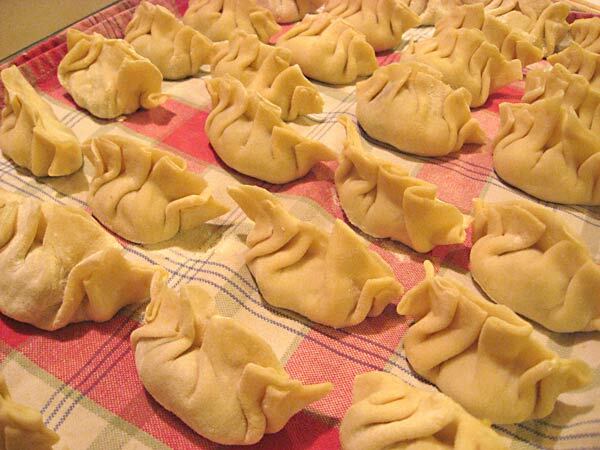 But I think many people are interested in making dumplings. This recipe looks very good. It is similar to the dumpling that my mom used to make. I will have to try this. Can I add you to my link, Tess? Welcome! I’d love a link! I think that these dumplings are made in many countries and they all sound good. 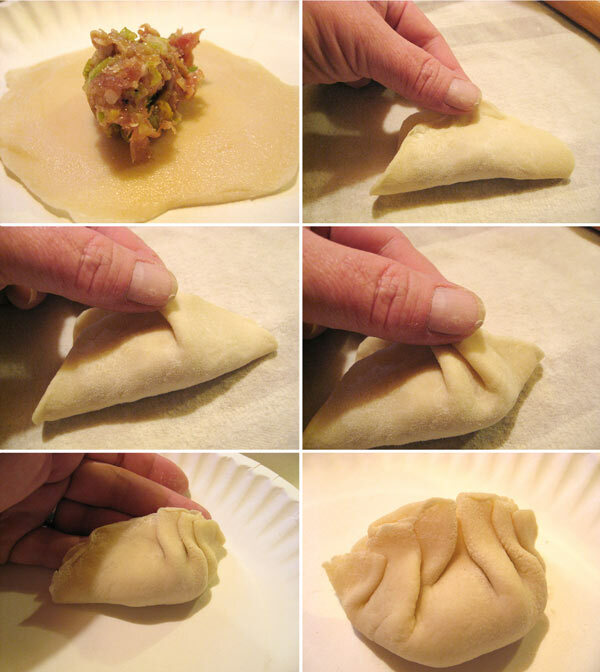 There is another recipe I’d like to try with wakame, pork, miso among other things in the filling. hi tess! i browsed into your gyoza recipe and i made samples just a little while ago. made the dough myself last night then mixed all the ingredients this afternoon. cooked around 6pcs and my sister ate it all. now, i’m making batches to last for a whole week and for lunch box to bring in school. thanks so much! i’ll be writing it in my blog and acknowledge you for that. by the way, i added worcestershire sauce and sesame oil on the meat mixture which added good aroma. Glad to hear that you tried the recipe and liked it. Worcestershire sauce and sesame oil sound like a good idea. Tess– I made this recipe using pork and it was really good! My one criticism is the taste, which was a little simple– I think I should have added more garlic or ginger (I love them too!). I made them twice– here’s a story from the first time which was scary at the time but is funny in retrospect (in a sort of “I can’t believe I did that, I’m such an idiot” kind of way). I had made the dumplings and added oil to the pan. I guess I must have missed the part where you said “medium” heat and instead saw the word HOT as in “HOT skillet” and “oil is HOT.” Guess which temperature I set my pan to. Now, I don’t know if you know this, but when you heat up oil to very high temperatures and then add water, something happens. So, after my dumplings had been cooking (burning) in the HOT oil, I added water. BOOOOOM! Huge explosion! Putting cold water in hot oil had created an unstable reaction, the result of which was that OIL WAS FLYING EVERYWHERE. No fire (thank god!) but lots of smoke. I freaked out and immediately went into damage control mode, trying to make it stop, turning off the heat (didn’t help), turning on the vents, and putting a lid on the pan. Needless to say, there was a huge mess. But you know what? They still tasted really, really good. Even after all that, I decided to let them simmer anyway, and they still tasted good, even when burnt! So, that’s my story. I may try that sesame oil suggestion for a more sweet-tasting, aromatic version. Worcestershire sauce is good if you add it to soy sauce and use it for dipping– it’s not Japanese gyoza without a dipping sauce! Sorry for the long post, I just wanted to tell you that story. I hope it doesn’t scare anyone away from this recipe, which is really good. Wow, that sounds scary! I hope you are using “boiling water” for future gyoza? Also, I posted about a slightly different way of cooking the gyoza here: https://1tess.wordpress.com/2008/06/04/gyoza-frying-the-dumplings/ using very little oil and a very well-seasoned cast iron skillet. Check out my post about pork and wakame gyoza. Hey! Im planning on trying this out for a project in my culinary class and want to make sure I understand, am I supposed to cook the pork before I fill the dumplings? And will the dough store well overnight? I won’t have enough time to make the dough and everything else during class, so I want to do as much of it as possible ahead of time. A culinary class? Do tell more! I don’t cook the pork before making the dumplings. You can mix the filling a day ahead, but I might prepare the cabbage and mix it in the day you make the gyoza. Sometimes cabbage gets soggy when it’s mixed in and left too long. 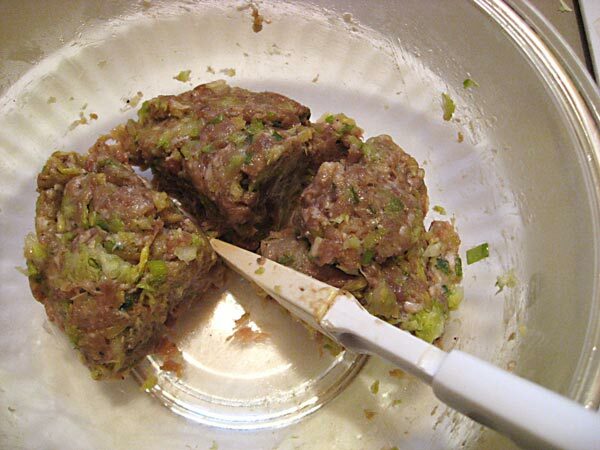 The cabbage is meant to keep the filling from turning into a tough little meatball inside the wrapper. You can mix the dough for the wrappers the day before and wrap it well to sit for an hour or so, then make the “logs” and they can sit overnight (also well wrapped). NOTE: this is what I usually do these days. Rolling them out goes pretty fast, but if you must make them the day before, roll the wrappers and dust each one very well with corn starch or potato starch before stacking. NOTE, I have not done it this way, but that’s how purchased wrappers work. Best wishes on your project and let me know how it goes if you can! Thank you Tess! Your suggestions will help a lot. I just felt a bit iffy about using raw pork, cause I’ve made perogies a lot before and the meat mixtures are cooked before hand, so I just wanted to make sure. I think I’m going to make the dough and wrappers on my prep day, so I can take my time on the second day to fill and cook them. I’m in the high skills cooking program at my high school, and the Independant study unit (ISU) is to cook something on your own and do a project on the history of that country, that sort of thing. Haha, no not some fancy culinary program if that’s what you thought I meant. Thanks again for the tips, I don’t cook until the 19th but I’ll tell you how it goes. Yes, and for raviolli as well, but in these, it’s half meat and half vegetable, and they both steam and fry. Plus each one only gets a small amount of filling. I thought that too when I first made them. For rolling them out, try to get an Asian rolling pin: about 1 foot long, 1 1/2-inches in diameter. This smaller roller makes it much more manipulable than the big pastry ones. You are rolling out small circles, so you don’t want anything so big! A dowel would work, as long as it’s clean. ps: I coarse chop bean sprouts sometimes and add them with the cabbage. Some people like Gyoza deep fried(like me), some like them pan fried so the bottom half of the dumpling is crunchy and the top portion is tender(my wife Rie), and some like them just steamed. I think the most important two things to remember are: 1. make sure the pork is cooked through and 2. serve it IMMEDIATELY after it’s cooked. They have to be hot, not luke-warm or room temperature. I find myself cooking and draining and serving for about 30-40 minutes while my family pigs out. The last 10-20 are for me. When you dip into the Soy/Vinegar/La Yu sauce with the Gyoza hot, it adds soo much more flavor. My son who is only 13 can eat 20 or more of these without even taking a breath. guess this is the one that i am looking for,..so detail and so clear..i’ll get back to you soon about “first gyoza”. Oh, have fun making the gyoza. They are one of my favorites, too. When you make your own, you can use what you like in them including shrimp or lobster or make them vegetarian! I’m definately going to try this out. I love gyoza and have gotten into making bentos for myself and my kids, so always looking for great lunch items. How long will these last after cooking them? You can freeze them on cookie sheets then store them in zip-lock bags for longer. A month or so??? Want to try this for an Asian pot luck supper, but would like clarification on whether or not I can make ahead of time. Someone commented that these must be served immediately upon cooking or they will get soggy. Later Tess referred to cooking them the night before, cooling before refrigerating. Can this be done without sacrificing flavor, and if so, how reheat? Also, what is shoyu and if I can’t find this (I live in the country) is there anything I can substitute? Shoyu is the Japanese word for soy sauce. Of course they are best when they are eaten immediately. For a potluck, I’d probably serve gyoza cold or at room temperature. If you try to keep them warm for very long, they will get soggy. Or if you can cook them at the potluck, I’d probably boil them first, then fry to reheat as my Chinese acquaintance suggested. They don’t get as crispy, but there is less risk of having to wash the pan after each batch. 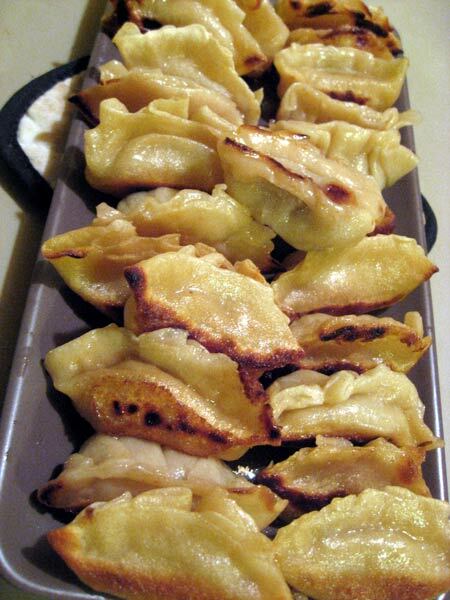 I love to make gyoza and your recipe for the wrappers is a great addition to my homemade filling! Thanks. I’m happy to hear that you enjoyed the recipe. Now you can make them whenever you have a craving! Let’s say you’ve made a batch of Gyoza and can’t eat them all; so you put them in the fridge. What’s the best way to re-heat them? I would freeze them on a cookie sheet, lined with parchment. Then you can warm them for your lunch at a later time in a mircowave. They will be edible. Or put them into a hot chicken stock soup. Or steam them. Or better: make a nice hiyashi chukasoba sauce and eat them cold with the sauce and some fresh vegetables. My personal favorite way, = cooked (firied) or not. If you have not fried them already, then freeze on a cookie sheet so they stay separated, bag them once they are frozen solid, Then up you can fry them as usual. Don’t thaw before cooking. Okay – so microwaving already already fried/cooked Gyoza is okay. I was afraid using the microwave might make them hard and rubbery. Would wraping them in tin foil and warming them in the oven be better? I am planing on making a few batches to freeze (before cooking) though. Your ‘Sweet Corn and Scallops Gyoza’ are on the list!!! A really low oven, covered with foil: might be the best way to re-heat. The hiyashi gyoza look amazing? Do you have a recipe for them or have I just not found it yet? Sorry for the delayed response – I was making my first ever batch of Shoyu Eggs!!! They turned out great and had to get a picture!! LOL, yes the hiyashi gyoza was just a summer way of serving leftover gyoza, cold but tasty in a nice soupy sauce. We hardly ever have leftover gyoza, by the way—so much fun to eat: like the old slogan for Lay’s potato chips. You are so right about the “Bet you can’t eat just one!” comment!!! I could seriously eat Gyoza everyday!! Have you heard of a restaurant called ‘Japan Express’? There aren’t many of them around but it IS an authentic Japanese fast food restaurant. I know several Japanese people who eat there and say it’s very close to home cooking (not everything though). Here is a link: http://japanexpress.us/menu.html – click on the titles and you can see the food. The only bad thing is the food is not served in traditional dishes. Their Gyoza are the best in my area – including the only dedicated, authentic, Japanese restaurants in the area (there are only 4 – the rest are those steak houses). I can’t get enough of them!! As for blogs, I have three of them but none have anything to do with food. If you would like, e-mail me at: correus at yahoo dot com and I will e-mail you the picture. I’ve often thought of creating a food blog due to my eclectic palate. I made a Ramen soup for the wife and I and placed half of one of the eggs in each bowl – along with sauteed chicken, snow peas, and Korean Hansung Seafood Nuggets in my own broth concoction. No I’ve not heard of “Japan Express” and from your link, it looks like it’s in Kansas? Looks really good. Your comment about the food not being served in traditional dishes, I must completely admit that my blog here, I don’t use the most optimal/traditional serving dishes either. At the old house, there was just no space for special dishes, and at this new house, well, I’m not a shopper. I concentrate on the food and hope my pictures make it look good enough for readers to try the recipes. Remember: I’m doing home cooking so every home is unique. Sure – you can post the pic. In fact I can cut the other one in half and get a picture of it as well. I hear you about the dishes. We use what ever’s on hand here at our house! However, when I do get to go to a Japanese restaurant I find traditional dishes make the experience even better! ‘Japan Express’ is a good place to eat nonetheless. The link I sent you was for the one here in Kansas. There are a few more out there though. We have had a new Japanese chain restaurant open up in Wichita; it’s called Tsubasa Traditional Japanese Restaurant. Go to the menu page on their site and open the PDF – you can see everything they serve AND the dishes they use!!! They are somewhat of a cross between ‘fast food’ and a regular restaurant. I’d love to get to know them enough to see if they would sell me some of their dishes. Some of those dishes are hard to get here. The wife and I bought a really nice set of traditional dinner ware that came with lidded chawanmushi cups as well as oshibori sets. The whole thing is made of china with a carp thing. Even the hashioki are carp! Anyway…I can’t believe you mentioned Ms. Shimbo’s book!!! I have it out right now!!! It was one of the first Japanese cook books in my collection. I would use it more often, but to be honest, I prefer the cook books with lots of pictures – they inspire me!